I’m not a believer in doing lots and lots of new things for the sake of it. If things are working, leave them alone. But there are times when it is good to reflect on what is working and if it means significant changes then so be it. For September, I was asked to tweak the scheme of work I created on Animal Farm a couple of years ago. It would have been fine to change the odd thing, but I realised that this was an opportunity for us to make a few more ambitious changes in how we start the GCSE course. Here are some of the changes. In addition, when we study a book as we read it, there is an arbitrariness in what we study when. We read a few pages or a chapter then do a lesson based on what we have just read. This can lead to lessons which are dictated by the page number not a deliberate decision. And every lesson is weaker because it is only based on a chapter or what has come before; it is never about the whole book. In the old scheme, we studied Old Major’s speech first only because it comes first in the book. Now it is one element in a lesson that focuses on how power corrupts noble ideas. Last year I was horrified when year 11 students started clearing out their lockers before their exams were over. There was a skip full of exercise books and I was disappointed that this rich revision resource was wasted. Students clearly didn’t value their books. We need to remind students that they can go back and read answers, read feedback, look at exam questions and resources glued in their books, and we can make explicit how to use exercise books as their ready-made revision guides. We can also design tasks which lend themselves well to restudy. 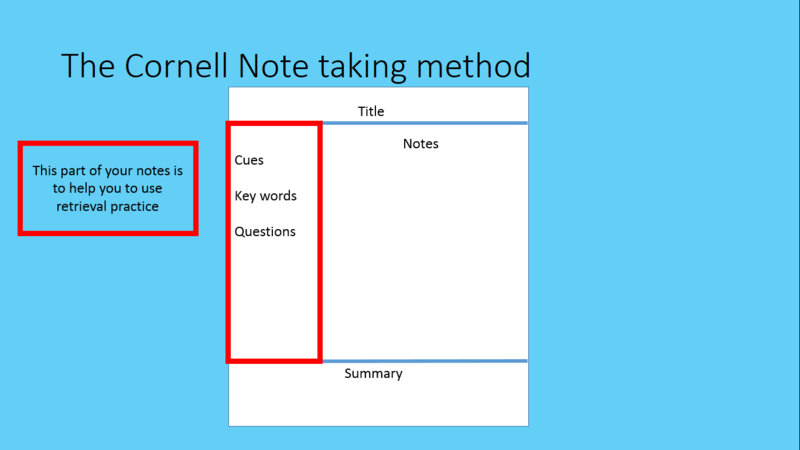 One way we have encouraged this is by using the Cornell note-taking method as we read the book. After each chapter of the book, we ask students to write up their notes. We explicitly model what good examples of these notes should look like and what each part of the notes is designed to do. In making the rationale explicit, we hope to ensure these students value their notes pages from day one and their exercise books are not quite as disposable. As well as an assembly for all students into the most effective revision strategies, we have explicitly taught how revision should look in English as part of this scheme. We have tried to concentrate on three clear and simple messages around revision using Knowledge Organisers: Retrieval; Elaboration; Organisation. (You can see in this post from our school blog.) General principles like these then get exemplified in lessons. For example, how do we revise quotations in English? We can’t just say ‘use flashcards’ – we have to model how to make them; how to use them; how to reflect on whether they have been successful. It has taken quite a bit of lesson time to teach these strategies properly, but I hope that the benefits will be seen over the next two years. I certainly don’t want to be frustrated in a year about a lack of revision when we can be very explicit from the start about what is expected. The magical land of gained time gave me an opportunity to really get to grips with a proper Knowledge Organiser. I have spent a lot of time trying to get the general principles of these right as part of my work with Bradford Research school and the Animal Farm Knowledge Organiser helped me to explore it practically. To be honest, it is really hard to produce a decent knowledge organiser, and mine went through several iterations. By really getting to grips with some of the most fundamental aspects of the text, it put me in a much better position to design the scheme. Do Now quizzes, homework tasks and revision were much easier to produce when I had a clearly designed Knowledge Organiser. My knowledge of the text improved. When I created the last scheme, the Knowledge Organiser was an afterthought and was little more than a revision guide. It’s dangerous to make any bold claims about the effectiveness of these approaches a couple of years before these students sit their exams, but I’m confident that we are laying a strong foundation by reconsidering our approach in this way.